Calendulis Plus Cream is an all natural product designed to treat the symptoms of eczema, psoriasis and dermatitis. It is a natural alternative to steroids. Relieves itching, redness and dry skin. For the best effects Calendulis Plus Cream should be used in conjunction with Grahams Bath Oil. Simply rub the cream into the affected areas after bathing or as required during the day (up to 4 times). 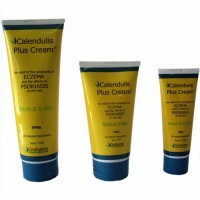 Calendulis Plus Cream need only be applied when the eczema is present. However a moisturizer should be used even when the eczema has cleared as this will help to prevent further outbreaks. The cream can be used on babies and the elderly, however as with any products, caution should be taken with sensitive skin. As with any product being used for the first time the Calendulis Plus Cream should be patch tested before it is used. Calendulis Plus Cream can even be used on the face but caution should be used to avoid the eyes and mouth. Calendula, Centella Asiatica, Propolis, Manuka Honey and Emu Oil, all in an Aqueous base. The preservative used to ensure your Calendulis Plus Cream is fresh right to the end of the tube is Phenoxyethanol. 100% pure Emu oil is a highly penetrative oil – Emu oil’s unique combination of polyunsaturated fatty acids has anti-inflammatory properties – These penetrate deep into the skin. With its combined effects of the naturally occurring vitamin A and E, Emu Oil aids in skin repair and faster healing. Together with the antibacterial Manuka honey and natural herbs, Calendula, Propolis and Centella Asiatica, these ingredients work to help reduce redness and relieve dry, itchy and irritated skin. For healthy skin you must try Calendulis Plus! As with any product being used for the first time the Calendulis Plus Cream should be patch tested before it is used. It is not uncommon to experience some increased redness, itching or a slight burning sensation when the cream is first used. This is the skin becoming used to the herbs in the cream and should not be severe or prolonged.